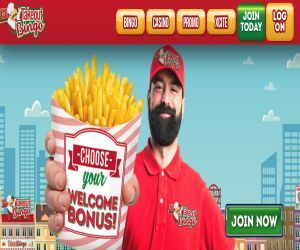 Takeout Bingo | Take out Tasty Bingo Bonuses! Takeout Bingo is open for business as the tastiest online bingo site in the UK! Join and get loads of sizzling bingo bonuses and play the best bingo games! Brought to you by Cassava/888, Takeout Bingo has thrown open it's doors, and promises a tasty bingo treat. Set in an authentic take out shop in the city with flashing signs, the site offers a green and red takeout-colour scheme. You'll be greeted by a super friendly Takeout delivery guy character in his trademarked red t-shirt and cap. So save some room, as he is ready to deliver you a delicious serving of bonus delights and bite sized bingo, slots and casino hits! There's more than enough promotions and bonuses to tickle your taste buds! When you sign up to the site, you'll be given the option to choose your own tasty bonus burger offer. You can take your pick from three delectable offers These will depend on how much you deposit and how hungry you are to win. You can either choose to add £10 to play with £30, add £20 to play with £70, or supersize your bonus package to add £50 and play with £200. While you get stuck into the games, there are plenty of signature Cassava deals. These range from Refer a friend, £200 No Lose Bingo and Penny Bingo, to Late Night Show, Spintastic, The Big £10K and a tasty slice of Free bingo. When you register with Takeout Bingo, you will be entered into the xCite Loyalty programme. This will reward you play with daily, weekly and monthly perks. You can also high-roll your way to the VIP programme for extra mouthwatering offers and games. Takeout also offers a super cool features like a handy guide to wagering requirements. You can also socialist with the other hungry players in community for more games and prizes. Keep checking here for the latest exclusive Takeout Bingo Coupon Codes. On the menu is a delicious delivery of bingo, slots and casino offerings. You can satisfy any bingo craving in the bingo lounge with a pick n' mix of 75 Ball , 90 Ball and 5 Line bingo rooms like Chatterbox or High 5. If you're still thirsty for adventure, you can spin through all the popular and hottest new slots games and progressive jackpot hits from the top software providers. These range from Aloha Cluster Pays and Guns N' Roses to Siberian Storm, Superman, Starburst and Fluffy Too. You can then head to the casino floor to test your skills with casino and table games releases. You can roll through the likes Baccarat, Deal or No Deal, Multihand Blackjack and French Roulette, to pick up more mouthwatering prizes . You can continue your tasty adventure on the go with Takeout Bingo mobile. Access all the bonuses, fun and games on your mobile, iphone, ipad, android and tablets.